Brunswick House is an eclectic Georgian mansion in Lambeth. 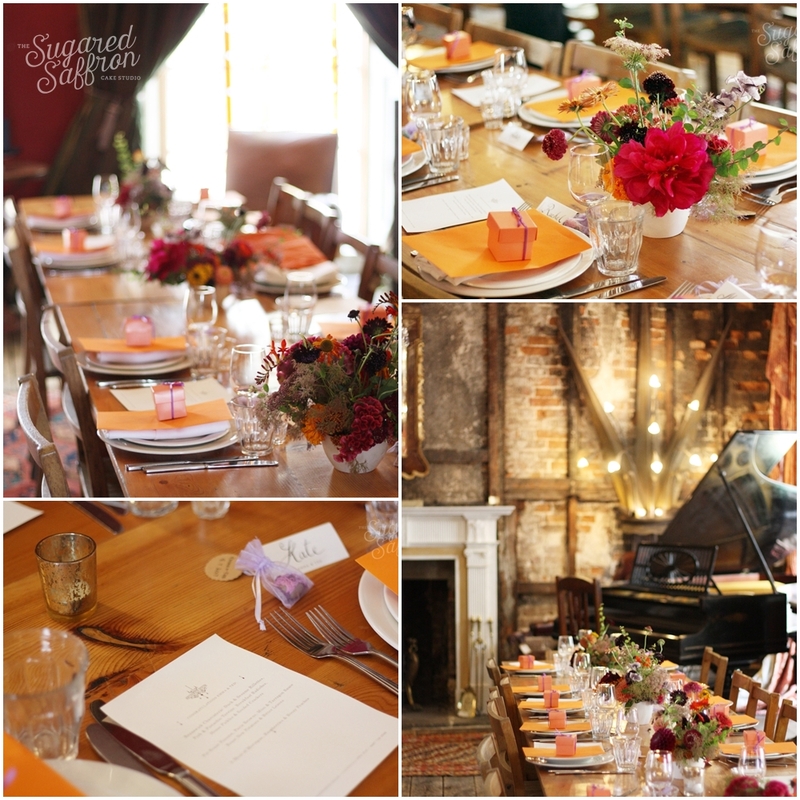 Full of odd treasures and bursting with character, it’s the perfect venue for a relaxed but unconventional (read not boho) wedding. E&T had their ceremony at the Asylum in Peckham and their wedding cake was to feed around 60 guests. We settled on a deep navy base with blousy flowers in bright coral/purple in the centre on a wash of gold behind them. We’ve had such a wonderful response to this cake! The couple adored it and then it blew up on instagram. It’s further proof that just because a cake is small, it doesn’t mean it can’t make a big impact. 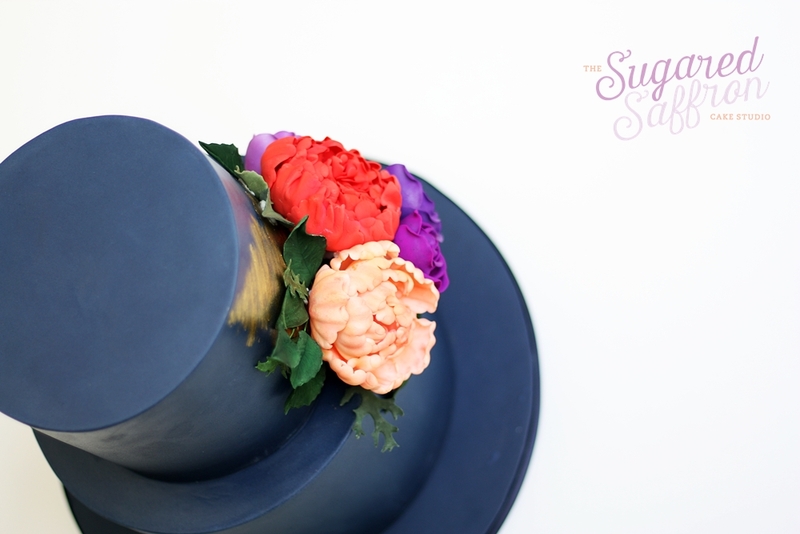 At Sugared Saffron we’ve always favoured creating something truly delicious that reflects the personality of a couple, over a colossal dummy cake where the only thought was how to make it bigger than X’s cake. We know that this is one of the reasons why we’ve made such strides in the at times cliquey wedding industry. We’ve honestly become one of the most sought after wedding cake designers in London without advertising, expensive wedding shows or taking on a more profit-oriented vision where any subpar cake can be thrown together in a couple of hours. 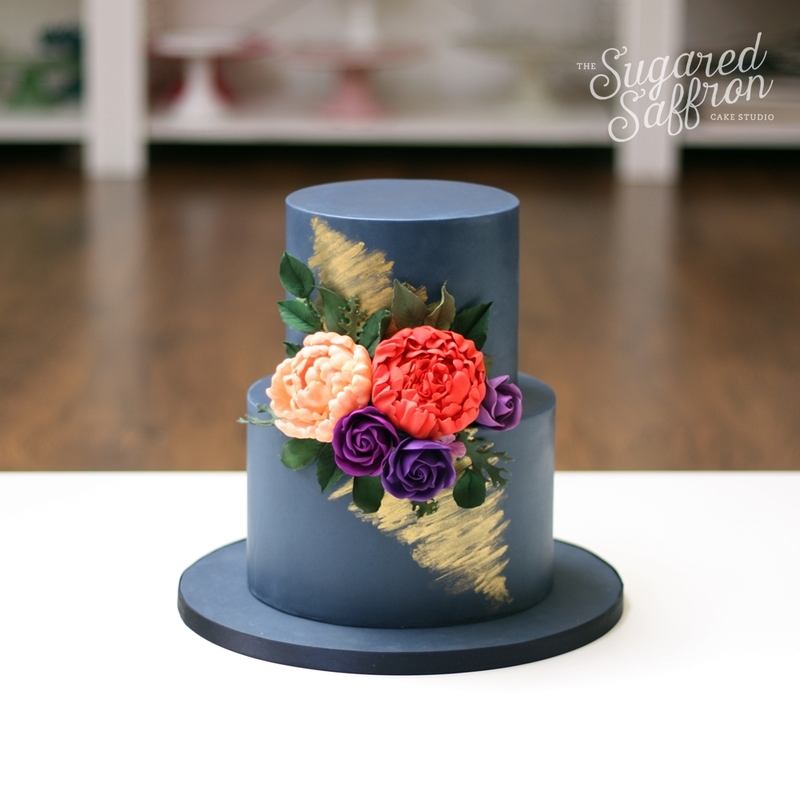 Where the cakes are never level, the sugarpaste always thumb printed, and the flowers made with zero attention to detail. From baking in what has to be one of the smallest kitchens in London and a £400 fortune, to having our very own studio space and paying our own talented freelancers, it’s been mind blowing. And we’re so grateful to the couples who understand this and come on board with us on our cake journeys. Wow! a cake which is just next to word amazing. The color combination is making this more beautiful and delicious.